Are you tired of big heating charges and costly repairs? Do not worry! It is never too late to catch up! If you did not have a tune-up and inspection of your HVAC system last summer, we could tell that you are in great trouble right now. So, before the cold season comes, make sure that your heating system runs at its most efficient state. Make sure to check your outdoor unit and clear things around it. Experts advised that outdoor units should at least have a two-foot clearance around them to maintain their efficiency and performance. Cut the shrubbery and remove limbs, grass clippings, leaves and other blockages that can impede proper airflow and efficient operation. Reduced efficiency and performance can be experienced if your outdoor fan is damaged or obstructed by debris. It is easy to tell that this part is impaired when you noticed unusual sounds during its operation. So if you noticed this problem, immediately call your local technician for early diagnosis. Check if your unit stands steadily on the ground after a storm or flooding. Contact your local technician when you hear strange sounds in your unit. Call the professionals when you noticed unusual odors like burnt wires or rotten eggs. Do not attempt to repair your unit yourself. You may never know it, but unchanged air filters can also make your season a tad costly. Dirt, dust and tiny debris that had accumulated in your air filter can cause allergies and respiratory problems to you and your family. Apart from that, unfiltered dirt can also cause inefficient heating indoors, as they impede proper airflow and push your unit to work harder. Be sure to change your filter as necessary as possible. While some issues with your heating seem workable, other things like maintenance might require professionals to get the job done. With preventive maintenance, all potential problems including inefficiency and costly repairs will be addressed earlier before they break the bank. If you want to completely check your heating unit and have it assessed , be sure to contact the professionals. 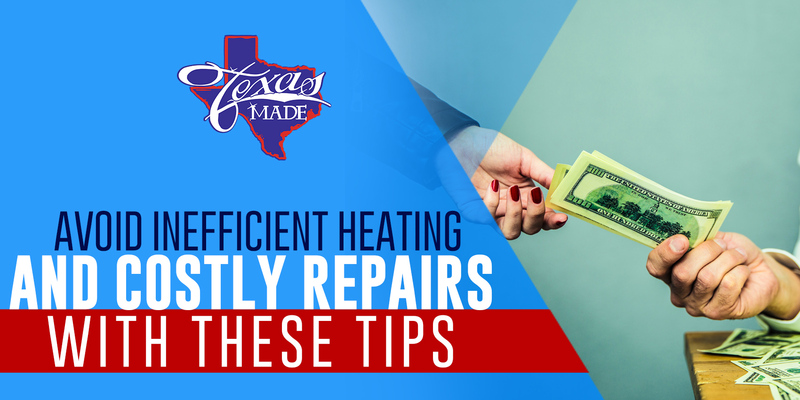 You can call us at Texas Made Air Conditioning & Heating to get your home ready for the cold season.